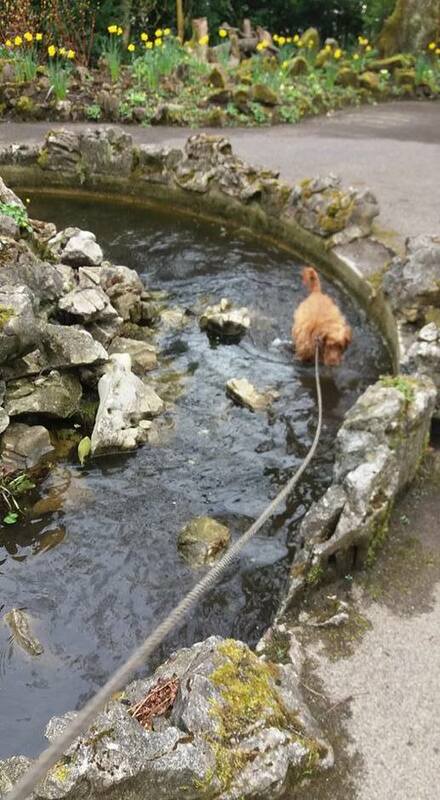 So this is evidence that my sweet looking, butter-wouldn't-melt little Golden Cocker Spaniel Milo really does jump into absolutely any body of water, be it a puddle or an ocean, without the slightest notice! I am usually on the ball but today he caught me off guard - twice! I was too slow to snap him in the first fountain (where he got himself entangled around the actual sprinkler and I had to use my walking stick to free him - nearly had to wade in - good thing I had wellies on!) However, he was more leisurely in his exploration of the second and therefore, I have photographic proof! Little monkey! Milo just's loves the water. Beautiful dog.